Now that Jeth and I have more or less settled into a new school and work routine, I’m trying to carve out some time to be creative so that my days and weeks don’t follow a work-cook-clean-sleep-repeat “survival” cycle. There’s nothing wrong with any of that, but I’m learning that I thrive on projects and doing things, especially things that are creative and new to me. I’ve started a couple of sewing projects, but I think Sundays are going to be my baking days. I am making it a personal goal to bake something new every Sunday, and if Jeth has is way I’ll be making mostly cakes (full disclosure, if I have my way it will be mostly cakes, too). Last weekend’s cake was lemon chiffon cake with lemon curd and Earl Grey meringue icing. Between the chiffon cake and the meringue icing, this cake is more or less like eating a cloud. No complaints from this household. This cake has the potential to be way to sweet, but a thin layer of lemon curd between the layers keeps things in check. 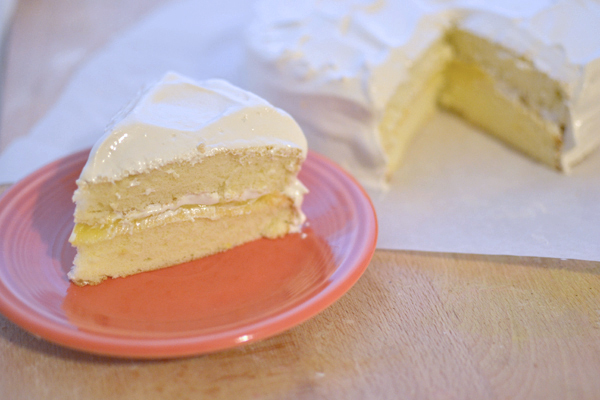 The trick to both the cake and the icing is lots of air – I really think I spent as much time whipping egg whites into peaks as I did on all the other steps of this recipe put together. It’s totally worth it, though – just maybe don’t try this without an electric mixer. Preheat your oven to 350°. Line the bottoms of two 8″ or 9″ round cake pans with parchment paper. In a medium bowl, whisk the egg yolks, oil, lemon juice, lemon zest, and water. Set this mixture aside – you’ll be coming back to it later. In a large bowl, mix together the flour, baking powder, salt, and 2/3 c. of the sugar. Create a well in the middle of the flour mixture and slowly add the wet ingredients. Whisk or beat just until the mixture is smooth. In a third bowl, whisk the egg whites until they are frothy. Gradually add in the remaining 1/3 cup of sugar and continue to beat the whites until stiff peaks form. Scoop about a third of the egg whites into the batter and fold it in gently until the whites are well incorporated. Fold in the remaining whites, being careful to knock out as little air as possible. It’s the egg whites that give this cake its light texture. Divide the batter between the pans and bake for 15-20 minutes, until the cake springs back from a gentle touch. It will still be soft, but your finger shouldn’t leave a dent. Allow the cakes to completely cool in the pans before using a knife to loosen the edges. The cakes should come out easily. This icing is delicious, and as long as you don’t mind dirtying a few bowls, it’s not too complicated. The original icing recipe (from Hummingbird High) came out a little thin for my liking, so I’ve added in the step of whipping the icing over a double boiler, since that thickens the meringue and concentrates the tea flavor. If you want to follow the original (simpler) recipe, it’s totally delicious – but you might want to add a little less tea than is called for. 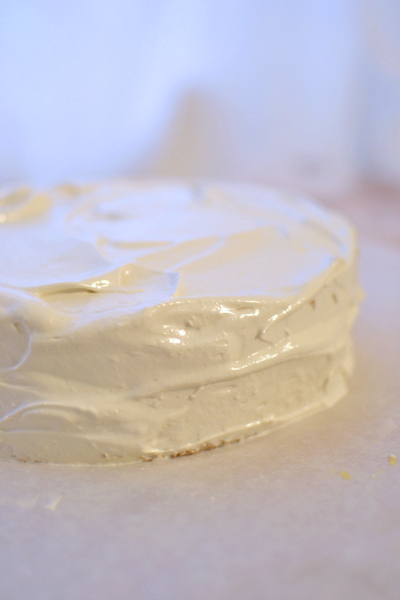 Whip the egg whites and cream of tartar until they are foamy and can mound – but don’t whip them into peaks just yet. Meanwhile, Heat the sugar and 1/3 c. tea in a small pot until the sugar dissolves. Simmer for 4 minutes, until the syrup thickens. Begin whisking the egg whites again, and add the hot tea syrup to the egg whites in a thin stream. Beat the mixture until the syrup is well incorporated, and then put the bowl of meringue over a small pot filled with 2″ of simmering water, double boiler style. I only have one pot, so I just rinse out the pot I made the syrup in and then re-use it for this step. That’s the most complicated part of this recipe, promise. Beat the meringue over the simmering water until it becomes thick and holds stiff peaks. Remove the meringue from the heat and whisk in the remaining tea, 1 T. at a time, until the icing is a nice, spreadable consistency. I’m sure I don’t need to tell you what to do after this step (but I will anyway): cake layer, lemon curd, cake layer, meringue. And spread a little extra icing between the layers if you’re feeling like you really need a sugar rush. The icing will get a little firm and chewy if it dries too much, so you definitely want to make it the same day you plan to serve it (or keep it in a really air tight container). Tags: baking, cake, dessert, recipe, summer, vegetarian. Bookmark the permalink.